ATTENTION SOPHOMORES: Class of 2020 Elections will be held in May. If you are interested in running for class office see Ms. Summers in the library or Ms. Myslinsk in Guidance for a self-nomination form. All forms are due this Friday, April 27. 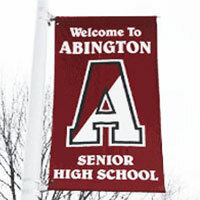 THE ABINGTON UNIFIED TRACK AND FIELD TEAM: The Abington Unified Track and Field team will be hosting a track meet TODAY, April 25, at 3:30 in Schwartzmann Stadium. We will be hosting Central Bucks East, Palisades, and Cheltenham. Please come out and join the Fans in Stands and cheer on our Ghosts! THE GENDER SEXUALITY AWARENESS GROUP: The Gender Sexuality Awareness group will be hosting the Day of Silence, this Friday, April 27th. Sign-ups will be this week during all lunches in Cafe A.
Abington Boys and Girls soccer team is hosting this 5K race/walk fundraiser on Tuesday May 15th (no school that day). Grab some friends and sign up for this spring 5K run. Awards for top 3 female and male finishers. First 200 participants will receive a free t-shirt. Sign up now! Event is rain or shine, so please dress appropriately. WORK STUDY: Work study students are asked to stop by room 224 to pick up the Due Date Sheet for the 4th marking period. The dates are already in Skyward as well, so please be sure to get paperwork submitted on time in this LAST marking period . See Ms Zieske if you have ANY questions or concerns about your grade. VIBE/IMAGINE: will be hosting a 3 on 3 basketball tournament on Monday, April 30th, from 3pm-5pm in the gym. Sign up in café A during any lunch period. Last day to sign up is Wednesday, April 25th. See any VIBE/IMAGINE member for rules and details. ABINGTON GIRLS’ LACROSSE TEAM: The Abington Girls’ Lacrosse team is selling t-shirts to raise funds for Autism Awareness. Pre-sales will occur in cafeteria A during lunch periods. The shirts are $10 and if you wear the shirt to the tonight’s, April 25th night games in Schwarzman Stadium, you will be admitted FREE. This is a doubleheader event so the t-shirt will provide free admission to the Boys’ Varsity lacrosse game against Upper Dublin at 5:30 PM AND the Girls’ Varsity game against Wissahickon at 7:00 PM.